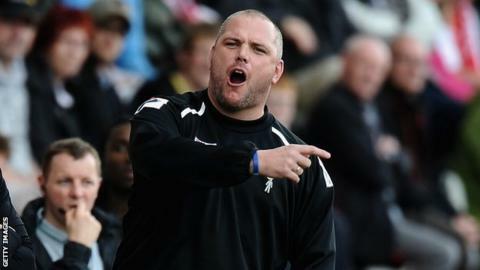 Manager Jim Bentley was furious with his side's sloppy start as Morecambe tamely went out of the FA Cup. Bentley, whose team are fifth in the league table, told BBC Radio Lancashire that poor preparation for the first-round tie contributed to their exit. "We didn't go about our business the right way from quarter past two. They steamrolled us in the first 10 minutes," said Bentley. Anthony Straker's early brace put Southend in control of the match, before Ryan Leonard sealed victory for the visitors. "They got two goals in front, and then after that it was a 'huff and puff' job," said the 37-year-old Bentley, who to remain at the Globe Arena until the summer of 2016. "I'll apologise to the supporters because we'll all hold our hands up - that wasn't acceptable. "It wasn't so much the first 10 minutes, which for me is where we lost the game, but the warm-up was slack and lethargic. "A couple of lads turned up late because of a fire on the M6, but you can't use that as an excuse."